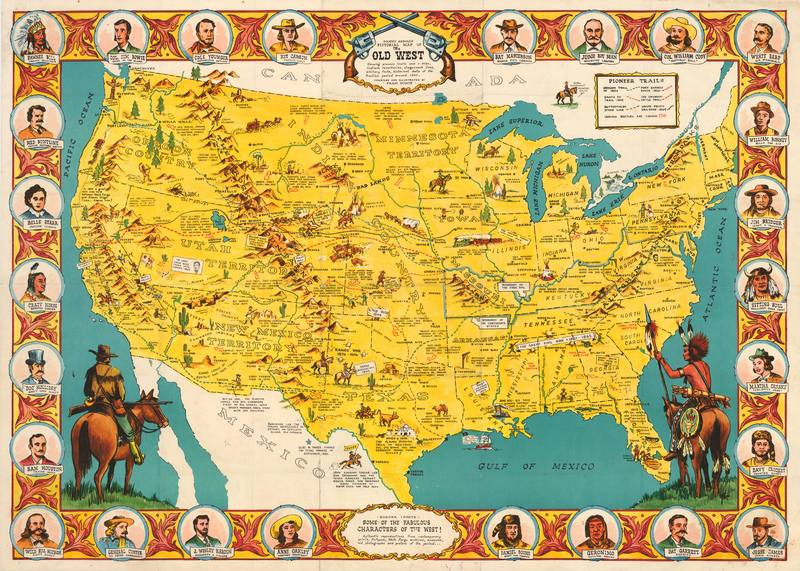 This fascinating vintage pictorial map depicts famous and infamous people and significant events primarily during the era of America’s move west, from approximately 1840 through the turn of the twentieth century. The map displays the United States and its territorial borders prior to declaring the Territory of Nebraska in 1854, and provides much information regarding America’s indigenous peoples and their countless tragic encounters with American military forces. Prominent names of Indian leaders are featured along with those of settlers, outlaws, and US political and military leaders. Much historical information is given and the dates of myriad adventures, misadventures, anecdotes and tragedies are included. While the veracity of some descriptions of events may be challenged, many events are historically accurate as depicted. Countless vignettes enliven the map and address events such as the discovery of gold in various regions throughout the west, the location of the hanging of John Brown, Abraham Lincoln’s inaugural address, and Robert Fulton’s construction of his first steamship. Of especial interest are the depiction of several overland routes including six of the most important, the Oregon, Santa Fe and Chisholm Trails, the Butterfield Stage Line, the Pony Express and the Union Pacific Railroad. The border is composed of portraits of the most well-known and oft-cited characters of the era, some of which include Geronimo, Wyatt Earp, Sam Houston, Wild Bill Hickock, Anne Oakley, Sitting Bull, and Kit Caron, to name a few. Condition: This colorful pictorial map is in B+ condition with some minor pen markings.